Ilham Aliev: “We are not a post Soviet country”. 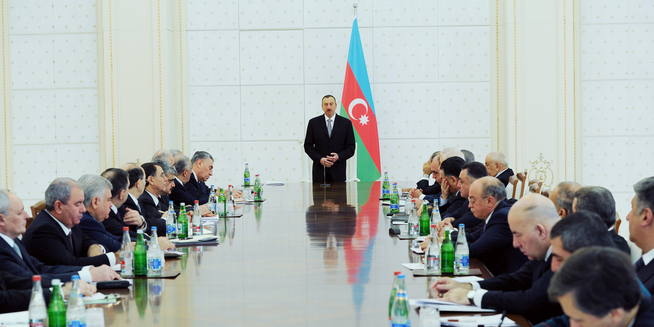 President Ilham Aliev addressing a meeting of the cabinet of Ministers in Baku on 15 January 2013. Azerbaijan has become the latest country to shed off its “post-soviet label”. The term long frowned upon by the Baltic states and Georgia amongst others, is often used to describe those countries that emerged from the collapse of the USSR in 1991. Azerbaijani President Ilham Aliev, who later this year will seek re-election for the third term, told a meeting of the Cabinet of Ministers that Azerbaijan had made great achievements in the economic field and in the sphere of international diplomacy. the President said that next month the country will also launch its first telecommunications satellite into orbit. Aliev said, “ Azerbaijan is becoming a space-faring nation, we are developing a space industry. a few years ago it was hard to imagine that there would come a time when Azerbaijan would become a space-faring nation. But that time is coming, and in the next few days we will celebrate this historic event. this, in itself, is a great achievement in every sense – for the prestige of the country, for its modernization and for the development of new technologies. It is also beneficial for business, because it is an economically viable project. Modernisation has been the hallmark of President Ilham Aliev’s policies since taking office as President in October 2003. the country has used revenues from oil and gas exports to change its image and restructure its economy. critics of the President however accuse him of not complimenting this with continued political and economic reform. Azerbaijan as a modern, tolerant and successful state, financially secure and developing fast in many spheres; and an opposition narrative of a quasi-totalitarian state where corruption is rampant, human rights abused and development benefiting only a limited section of the population. Close observers of Azerbaijan say that there are strong elements of truth in both narratives. In the run up to the Presidential election in October it will be up to Aliev who holds all the strings of power, to try to narrow down these differences, regardless of whether or not he will be faced with a credible challenge in the election, which is still doubtful. Skeletons fall out of Saakashvili’s cupboard. Prosecutor General says there is worse to come.